Pustak Ka Vivaran : Hindi bhasha ki utpatti yadyapi navam shatabdi hi mein ho gai thi, parantu gadh mein sahity ka pata ke shatabdiyon ke pashchat se chalta hai. Abhi tak hindi ke sarvapratham gady-lekhak guru gorakhanath ji hi mane ja rahe hai. iska rachna-kaal 15 v. shatabd ka aadi bhag mana jata hai. Inke pahle hindi-gady-lekhak ya to hue hi nahin aur yadi hue bhi to unke grantho ka pata ab tak nahin lag saka hai………….. Description about eBook : Hindi language originated in the ninth century only, but it runs after centuries of literature in Ghad. 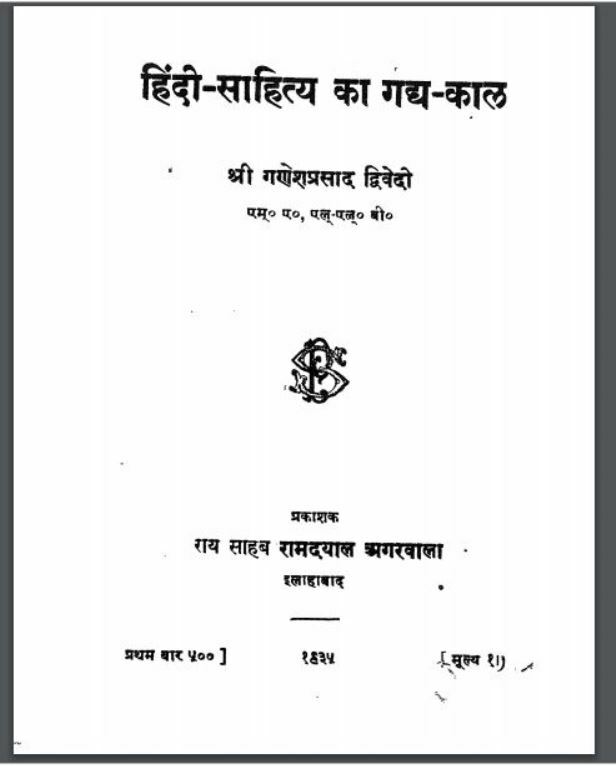 So far, the first prose-writer of Hindi is being considered by Guru Gorakhnath ji. Its composition is considered as the part of the 15th century. Before them, Hindi-prose-writers have not existed and even if they have not even found their texts yet…………….